Since moving to Spokane, I’ve felt just a hair smug about my situation—at 2,000 feet above sea level, there isn’t much danger of flooding from sea level rise—and we’re pretty far removed from both hurricanes and tornados. Wildfires happen, but usually at some safe distance from the urban area where we purchased a home. So the storm of last Tuesday was a bit of a shock—winds of up to 70 miles per hour and heavy rain persisted for several hours. Which on the face of it doesn’t sound too bad—we had storms like that every year in Kotzebue—but Spokane never gets weather like that. 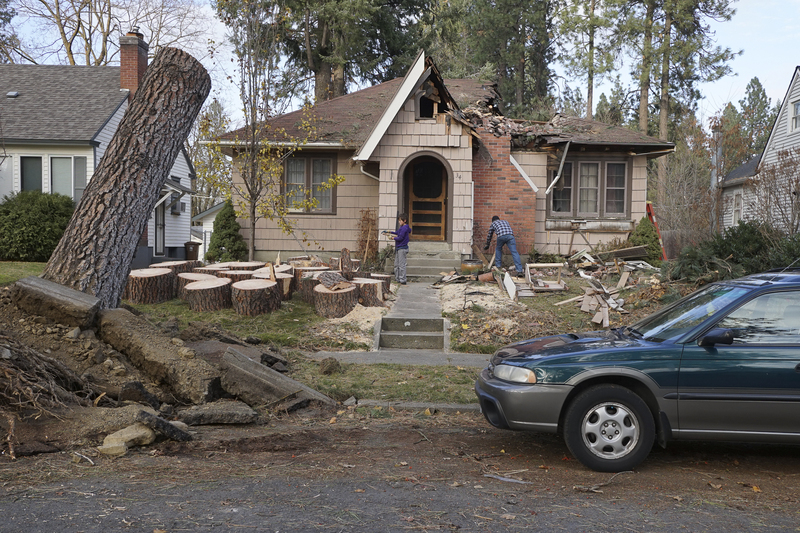 What happened was that the majestic Ponderosa Pine trees that grace our neighborhood fell in large numbers—some of them uprooted, some snapped in half—but all of them falling in thunderous crashes. My son and I were watching a movie during the storm until the power went out—about 4:30 in the afternoon—I then moved to the kitchen and was on a call to my wife (who is on the east coast) when a tree in our neighbor’s back yard split and fell. The next morning, the extent of the damage became a bit more clear—the radio station I usually listen to for local news was off the air. I drove to a local department store to purchase a propane lantern and propane for a camp cook stove—the store was open, but operating on emergency power—and the shelves of batteries, lanterns, were quickly being emptied. At the cash register, people were purchasing a variety of items—hot coffee, ice, and a 1.75 liter bottle of vodka were on the non-moving belt in front of me. My son, attending a local community college, found his normal path to school blocked—I drove with him to find an alternate route. 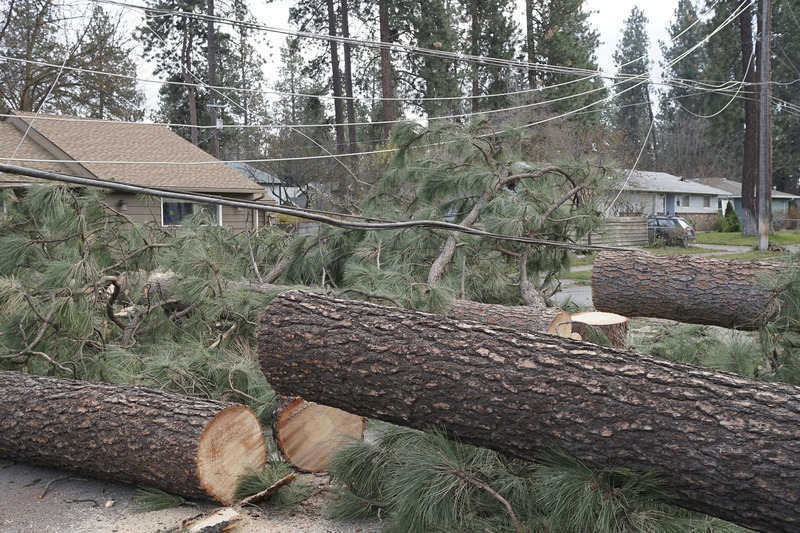 Along the way, dozens of trees were downed, many with power lines tangled in them. I’ve done several short walks in our neighborhood since the storm—something I’ve done frequently since moving here—but now the walks are a bit more interesting. A number of homes along routes I often walk have been damaged by fallen trees. 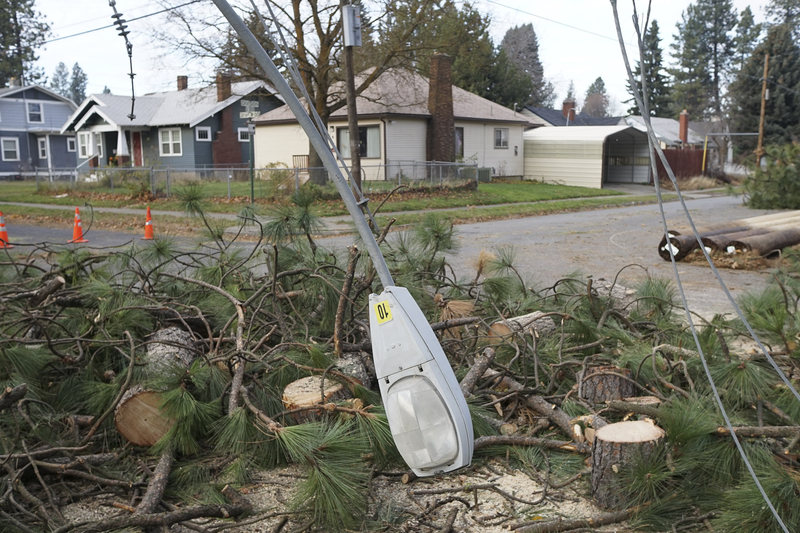 Crews of men have been clearing the streets, replacing power poles, and repairing wires. More than a week after the storm, we still do not have power at our house. I reported the outage at our home to the utility early in the morning after the storm. 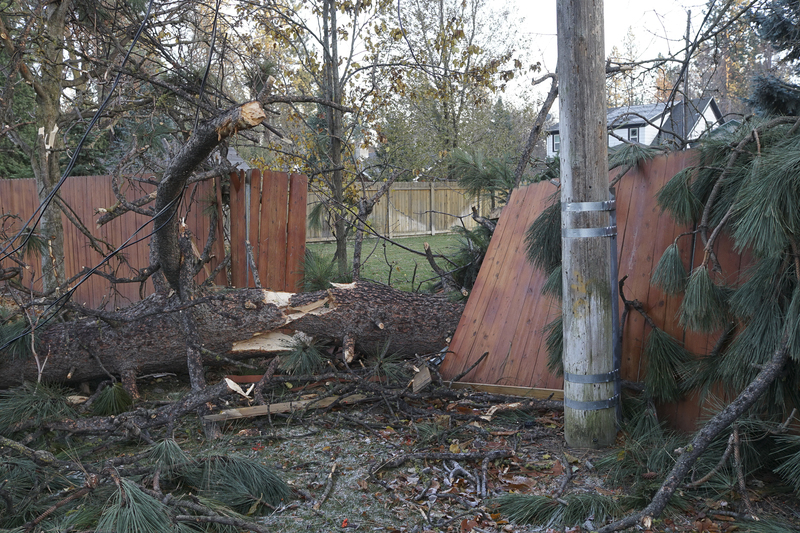 The utility, to date, has not acknowledged my call, nor have they sent a crew to even observe the damage. I’m trying to be patient, but the utility PR department keeps saying that “all power will be restored in 2 days”—they’ve been saying that for a week now. I no longer believe them. We have a gas hot water heater, which is working, and so have hot water for showers and washing dishes. However, the furnace is not operating, as the circulating fans need power. Our house is holding steady at about 48 degrees inside—not exactly comfortable, but not close to freezing pipes (yet). I’m trying to maintain my sense of humor—but my reserves in that department are wearing thin. I try to think of people who have lived through real disasters—Katrina, Sandy—storms where whole communities were destroyed—and know that we are doing fine. But still—I just want my damn power back. We were without power for five days earlier in the season. Heavy snow caused trees to fall on the power lines all over the borough. I was able to keep the freezer and refrigerator working along with the furnace by placing a small generator outside a basement wall, putting a hole through the wall and stringing extension cords throughout the house. I understand that there are more elegant ways of handling this. When did the power finally come back on at your place, or has it? We got our power back after 9 days–the repair crews arrived mid-morning on Thanksgiving day, right as Ben and I were loading our rig to take our thawed turkey to the farm–90 miles away–in the middle of the mountains–but a place that still had power. We didn’t come home for 3 days–but the power company left a message on our phone indicating that power was restored several hours after we left–probably right about the time I put the meal in the oven. In Fairbanks, part of being Alaskan was knowing that you are living in a place where nature is still very much in control, and if the power goes out and you don’t have emergency plans, the house can freeze up in hours. We had wood stoves, Coleman lanterns and stoves, and were ready for either a power outage or a furnace failure. Our house in Spokane looks like it is in an urban neighborhood–or at least a “western urban neighborhood”–meaning that you still almost need a car to get to Starbucks or a grocery store. So the fact that we spent more than a week without power was unexpected. Not that it was all that bad–the temperature in the house never went below 45–far from freezing–and when I finally cleaned out the freezer after 9 days, much of the food on the bottom was still frozen, albeit slimy from liquids from the thawed food on top. The boredom was the worst part–the interruption of normal patterns–no movies, reading books by flashlight, no internet. I’ve spent years of my life living in field camps with almost no electric power–you can set up patterns that make that life acceptable–but waiting for the lights to come back on seems just like Chinese water torture. I just wanted the damn outage to be over. OK, this is whining–but I’m glad the power is back on–and I’m accumulating better back-up supplies for the next time this happens…. Now that I know it can. Wow. I had no idea Spokane was hit so hard. But of course I live in Seattle, which is on the other side of the mountains. Judging from the media, we are closer to Asia than we are to Spokane.